Formulation: The dual-phase composition features precious rose water and nourishing plant extracts of eyebright and fennel which harmonize and soothe the particularly delicate and sensitive skin in the eye area. Premium-quality sesame and sunflower oils nourish the eyelashes and eyebrows as they preserve the skin’s natural hydrolipid layer. Ophthalmological and dermatological tested. Protect against light and heat. This is the best solution I have had in removing my makeup. Easy on the skin. I began to use Dr. Hauschka because my eyelids reacted to every other eye cream or shadow on market. Dr. Hauschka eye balm was great for me. I tried the new eye makeup remover. It was soft oil and removed makeup gently leaving a soft moist feeling in eye skin with no reaction or sensitivity. It felt dewy and softly moist around eyes after. Great! Love this!! It does not hurt my eyes at all and works beautifully. I love this eye make-up remover. It gently removes eye make-up and does not irritate my eyes at all! I also love the cloth pads that came with it. They easily rinse clean with a little bit of soap and are reusable. This is the best eye makeup remover I have ever used. Bravo Dr. Hauschka. This eye makeup remover works great and is gentle on my sensitive skin. Have loved everything else I use from Dr. Hauschka but this was very disappointing. It burns my eyes and it does not remove eye makeup well at all and i do not use waterproof makeup. I love the eye make-up remover. It gently takes off all the eye make-up and smells wonderful. My eyes feel moisturized and not dry as they sometimes do with other products I have used. Thank you for making such wonderful products. For decades I've been trying to find an eyemakeup remover that worked but did not irritate my eyes - made worse by chemotherapy last year. THIS IS IT! For the first time ever, my eyelids are not itchy after cleansing! TIP: use your fingertips to spread a drop of this cleanser on each eyelid, then use a slightly damp cotton pad (NOT a puff) to gently wipe away. That way you get minimal stretching and minimal lint but still perfectly clean. Removes all traces of makeup! Gently removes every bit of eye makeup and wipes off cleanly leaving the skin around my eyes soft and moisturized. Smells wonderful and is easy to use after cleansing. 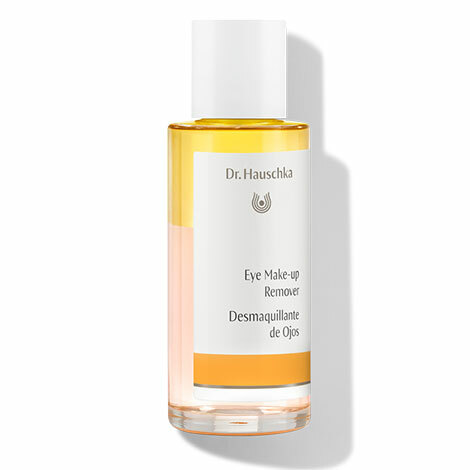 I’’m so glad Dr Hauschka added this product to their lineup. I prefer products that are easy and quick to use. I used a cotton ball to take off the eye make-up and had to use it multiple times and used lots of the remover before I was done. I felt that I could deplete the bottle very quickly if used every day. I did not use the pads provided because I thought I would never want to have the additional expense of purchasing them and I always have cotton balls here. We are sorry you are disappointed. We hope you will consider using the reusable cotton pad included to see if you have better results than with a cotton ball. Just a quick question for you, have you been shaking the bottle to mix the dual phases before use? If you would like to discuss further, or to learn more about our returns process, please give us a call at 800-247-9907 9am-noon and 1pm-4:30pm Eastern Time, Monday through Friday. Works well and does not irritate my eyes at all. Thank you for your Eye Makeup Remover comments. Thank you also for your feedback on Regenerating product packaging. To protect delicate products like our Regenerating line for mature skin we need an airless pump packaging to exclude both air and light. Currently this technology is only available in plastic packaging but the plastic is tested as stable against leaching and contains no BPA. We hope this information is helpful. Thank you. Shake the Eye Make-up Remover before use to combine the oil and water phases. Moisten a cotton pad and gently wipe across the eye working outwards. If necessary, leave on briefly and allow to work. Next, use Dr. Hauschka Cleansing Cream or Soothing Cleansing Milk to remove make-up and impurities from the rest of the face. While applying eye make-up, you can dampen a q-tip with the Dual Phase Eye Make-up Remover to correct mistakes and remove excess shadow around the eye.